Once again, the State Fair of Texas has released this year's listing of the Big Tex Choice Award Finalists, and, as always, the recipes are designed to amaze. Eight new contenders battle each year to get a Big Tex statuette and a place alongside notable fried foods at the State Fair of Texas, running Sept. 27 - Oct. 20, 2013 at Fair Park in Dallas. Previous Big Tex winners include Deep Fried Jambalaya, Deep-Fried Bubblegum, and Buffalo Chicken in a Flapjack. 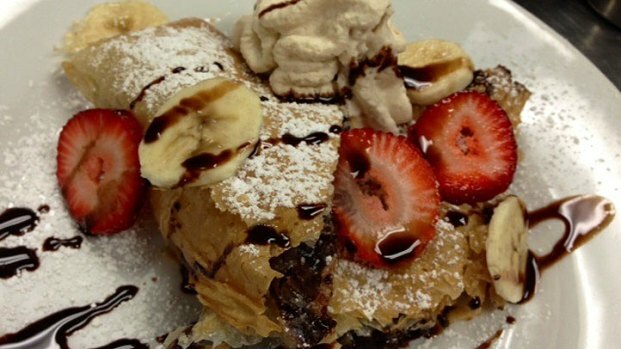 Awesome Deep Fried Nutella® – Cream cheese and Nutella® are whipped and spread over flaky Phyllo dough sheets, rolled up and deep-fried. Served with a drizzle of honey and shaved almonds. Deep Fried Cuban Roll – A filling of slow-cooked pork shoulder, chopped ham, Swiss cheese, pickles and secret sauce is spread onto a slice of Swiss cheese, rolled up in pastry dough and deep-fried. Roll is served with a side of majo sauce for dipping. Fernie’s Deep Fried King Ranch Casserole – This stick-to-your-ribs TEXAS-SHAPED creation is melted cheese, salty, spicy goodness that is dipped in a zesty southwestern egg wash and coated in panko bread crumbs. Deep-fried golden brown and crunchy on the outside, steamy and creamy on the inside! Served with a side of red, white and blue tortilla chips and your choice of our homemade “salsafied” sour cream or cheesy queso. Each one proudly flying the flag of the Lone Star State and deep-fried in the Heart of Texas! Fried Thanksgiving Dinner – Mama’s homemade stuffing and diced roasted turkey are rolled in a ball. Next it’s dipped in southern cream corn and rolled in seasoned corn meal — all fried to a crispy golden brown and served with old-fashioned giblet brown gravy. The zesty orange cranberry sauce fills your dipping needs and results in a complete Thanksgiving dinner, FRIED! Golden Fried Millionaire Pie – Sweetened, fluffy cream cheese filling is loaded with golden pineapple and Texas pecans, then wrapped in a flaky pie crust and fried to a golden brown. Topped with whipped cream, toasted coconut and candied pecans. Spinach Dip Bites – Creamy and delicious spinach-artichoke dip bites are coated with crispy tortilla chips and flash-fried until golden brown. Bites are served with salsa for an additional kick. Southern Style Chicken-Fried Meatloaf – Homemade meatloaf slices are coated in an authentic Texas chicken-fried breading and deep fried golden brown. Served with garlic mashed potatoes, Texas cream gravy and a ketchup/brown sugar glaze for dipping. Texas Fried Fireball – Pimiento cheese, pickles, cayenne pepper and bacon are rolled into a ball, dipped in buttermilk, covered with a jalapeno-infused batter and deep-fried. Served with chipotle ranch for dipping. The winner will be announced on Labor Day, Sept. 2.